Most scientists define molecular biology as a branch of science that explores biological activity at the molecular level. Molecular biology is closely connected with such sciences as biology, chemistry, genetics, and biochemistry. The interaction of cellular systems in terms of the way DNA, RNA and protein synthesis function is the main sphere molecular biology pays attention to. Molecular biology looks at certain mechanisms that lay behind such processes as replication, transcription, translation, and cell function. Besides, some scientists claim that the processes of genes transcribing into RNA and RNA translating into protein lie in the basis of molecular biology. Nevertheless, these thoughts are currently reconsidered. Knowing about the basics of molecular biology, you can make your own definition of molecular biology. The main techniques of molecular biology are as following: molecular cloning, polymerase chain reaction, gel electrophoresis, macromolecule blotting and probing, microarrays, and allele-specific oligonucleotide. Molecular biology plays an important role in the development of medicine. Understanding the process of cells formations, actions, and regulations can help scientists to create new drugs, provide diagnosis of diseases, and improve knowledge concerning the cell physiology. The explanation of the flow of genetic information is called the central dogma of molecular biology. The dogma helps to understand the transfer of information between sequential information-carrying biopolymers. There are 3 types of biopolymers: DNA, RNA, and protein. There are 9 types of information transfer that occur between these polymers: general, special, and unknown transfers. 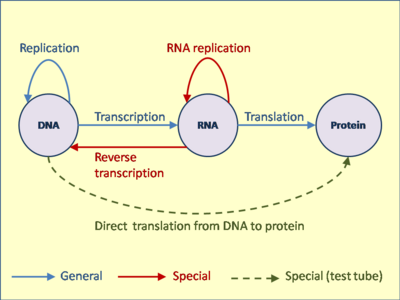 The central dogma plays a vital role in the cell. However, some of its aspects aren’t accurate. Talking about molecular biology, it’s necessary to provide the definition of a molecule. Generally, molecule is defined as a small particle or substance. In biology, molecule is a substance produced in living organisms. For example, proteins, carbohydrates, and DNA are molecules. Molecules can be divided into 4 classes: carbohydrates, lipids, proteins, and nucleic acids. All of them have certain functions. Carbohydrates are sugars. Their main function is to produce the energy molecules ATP. Besides, carbohydrates can be used for strengthening the walls of cells. Lipids include fatty acids and cholesterol. As oily molecules, lipids are the source for steroid hormones and vitamin D. Their main function is to form cell membranes. Proteins provide enzymes for making chemical bonds, breaking them down, recycling molecules, and increasing the speed of chemical reactions in cells. Nucleic acids are the molecules that carry the genetic information for making macromolecules. In order to understand the main notions of molecular biology, students should study it systematically. Taking into account a brief molecular biology review, the course includes the following topics: key terms, central dogma of biology, genetic code, bioinformatics genetics, genomics, and proteomics. These are the topics that every student should know in order to get great marks for their biology assignments. 1. What is the definition of molecular biology? 2. How do you understand the notion of central dogma of molecular biology? 3. What is a molecule? 4. What techniques of molecular biology can you name? 5. What effect does molecular biology have on medicine? If some of these questions were difficult for you, review your biology notes. Read some additional information. You can always consult our professional biology tutors that will explain every topic and help you omit bad marks. We can provide you with the best biology homework help. The following links may help you improve your knowledge. These sources provide information concerning the main topics of molecular biology. Check them out.